Why Cuba? White-sand beaches, exotic rhythms and culture are only the beginning. Friendly people, beautiful beaches, colonial Spanish architecture, vintage automobiles that take you back in time and infectious rhythms that make you lose track of it. What's not to love? Cuba has long been a sought-after travel destination for Canadians, popular for its charm as well as price tag. With recent events, expect many more visitors soon. Get there before it all changes and don't miss out! Can't picture yourself in Cuba yet? Maybe some of our favourite experiences will convince you now's the time. As a day-trip or as your main destination, don’t miss La Habana Vieja! Join the locals on this 8km seawall for ocean views and people-watching. This mid-19th-century colonial town is a World Heritage site and full of charm. Stop to take in Cuba’s exotic beats and enchanting rhythms. 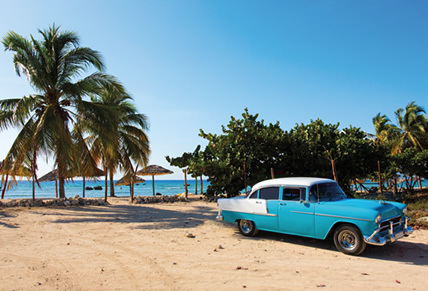 Cuba enjoys a subtropical Caribbean climate with an everage temperature of 24℃. Visitors can enjoy the country at any time of the yeat but in general, the best time to visit is during the months of December to May, where days are more likely to be dry and sunny. From June to November, Cuba can be hot, humid, and/or rainy. August is the hottest and most humid month. High season for travel tends to be between November – March and July – August, and prices are highest around the December holiday season.